Hello my wonderful readers! I've got a surprise for you! I'm having a giveaway of some AWESOME products by a company called EcoSMART. I'm telling ya - you'll want to try to win this giveaway, because I've used their products and they REALLY WORK! I'll be singing their praises for years to come. 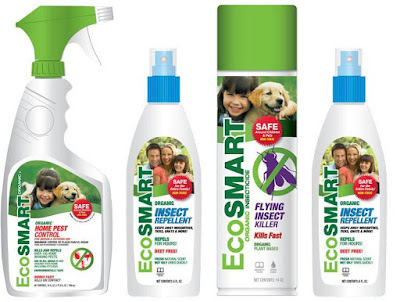 In fact, HERE is the prior review I did on some of EcoSMART's products. Honestly, I can't say enough good things about their products! EcoSMART makes completely organic pesticides, which are safe for children and pets. Did I mention this stuff works??? I LOVE their organic insect repellent. I use it when I go on photo walks and come back with NO TICKS. I also use it when I'm fishing, and it keeps the mosquitos away. I'm extremely excited to be able to offer you the chance to try some of their products so you can also enjoy organic home pest control! EcoSmart has agreed to send the winner of my giveaway the VALUE BUNDLE of your CHOICE! You can see all of the value bundes HERE. I received and reviewed the Safe Picnic Value Bundle, and I love the Insect Repellant so much, that I intend on purchasing the Safe Personal Care Value Bundle, because I don't ever, at any time, want to be without it! Because I want to get the word out about EcoSMART and their great products, if you post, twitter, or facebook about this giveaway, you can get an extra entry for each that you do. When: The giveaway will close at 5 p.m. on Sunday, July 18, 2010 CST. Then What: A winner will be chosen randomly and announced on Tuesday, July 20, 2010. The winner will then need to send me their shipping information, and EcoSMART will ship your product and send me a tracking number. The winner should be enjoying their organic pest control products in approximately seven business days. *Be sure to let me know in separate comments if you Tweet, Facebook status, or post about this contest for the extra entries. I would love the Safe Home bundle. We've used these products before and LOVE the wasp and hornet killer and the insect spray (smells like cinnamon) and really like them because they are kid friendly BUT our local department store stopped carrying them! Anyway, please kindly enter me. Misty: A safe garden bundle would be great. I hate mosquitoes but don't like the regular repellent, so I'd love to try this. I think I'd like the Safe Plant & Garden Value Bundle because I hate bugs in my garden, too - but I don't want to put any chemicals on it. blog post - I'd really like to try these products. I like to try Safe Plant and Garden value bundle.